Our firm represents both large and small for-profit and not-for-profit corporations, locally and nationally, in complex business situations. Our business/corporate practice extends to any challenges facing your business or non-profit, from assistance with transactions to representation in litigation. Our attorneys bring vast transactional experience, handling everything from simple business formation to complex transactions impacting entire businesses. Specifically, our transactional practice spans across all phases of the business life cycle including: business formation (limited liability companies, for-profit corporations, non-profit corporations, partnerships, and joint ventures), entity continuation (governmental filings, director resolutions and other compliance matters), contract review and negotiation, public and private financing, taxation, real estate matters (zoning, leasing, commercial landlord disputes), mergers & acquisitions, franchising, copyright and trademark law, debtor and creditor rights, loan workouts or modifications, bankruptcy (Chapters 7, 11, and 13), and business liquidations. We also serve as general counsel to several corporations, representing their everyday needs. For our non-profit clients, we prepare and file Encouraging Diversity, Growth and Equity (“EDGE”) and Minority Business Enterprise (“MBE”) applications with the Ohio Department of Administrative Services. In addition, we prepare and file charity renewal applications on behalf of our clients in over 20 states, as well as Form 1023 applications with the IRS to obtain tax-exempt status for our clients. Unfortunately, not all business relationships work out as intended. That is why our business/corporate practice doesn’t end with transactional representation. When business situations devolve into outright disputes, our clients trust us to be their advocates. Our business attorneys have extensive litigation experience in all state and federal courts throughout Ohio. We represent companies, large and small, engaged in all kinds of disputes including: prosecution or defense of breach of contract cases, enforcement of contractual covenants, employment disputes, enforcement and defense of non-competition agreements, officer and director liability, and government regulatory challenges. We are zealous courtroom advocates, but we also recognize that litigation can be expensive. That is why our litigation team seeks to leverage pre-suit negotiation tools, alternative dispute resolution, and mediation as alternatives to the expensive and time-consuming litigation process. Our attorneys are experts at employing these tools to effectively resolve disputes early so your business can get back to what it does best. 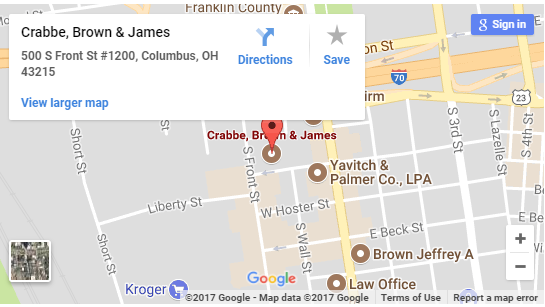 No matter what challenges you and your business face, Crabbe, Brown & James’ business/corporate group is up to the task.